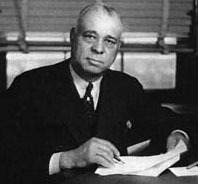 Arthur W. Mitchell was the first Black Democratic congressman. He represented Ilinois from the Seventy-Fourth to the Seven-Seventh Congress, first defeating Republican Oscar DePriest. Involved in civil rights, he won a significant case before the 1941 Supreme Court involving "seperate but equal" accommadations on interstate travel.